This is an ARC sent to me by St. Martin’s Press. It is due in stores July 19, 2011. 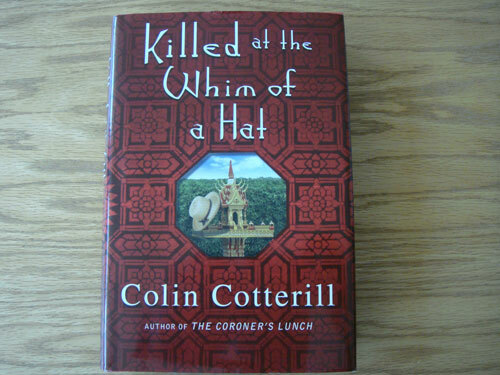 Refreshingly original characters, and settings, with more than a dash of humor makes “Killed at the Whim of a Hat” one of the most enjoyable reads this year (or any year). *Sigh* He was our President and a Harvard graduate…..’nuf said. And yes, there is an explanation why Bush quotes are used. Jimm Juree is a crime reporter for the Chiang Mai Mail newspaper. Her and her family live in Chiang Mai and are, basically, in a holding pattern. Living day to day. One day, Jimm’s mother, Mair, decided to sell the family home (without consultation with the rest of the family) and take over the rundown Gulf Bay Lovely Resort and Restaurant at Maprao in the Chumphon province (it is in southern Thailand on the Gulf of Siam (Thailand) near the town of Pak Nam). Needless to say the family was NOT happy, but, all but one made the trek and settled in their new surroundings. Once there….the excitement starts. In a part of the country known for it’s laid back peace and quiet the excitement level rises when a VW Kombi with two skeletons is discovered buried in the ground, and, then the excitement level reaches epic proportions when, shortly thereafter, a Buddhist Abbot was brutally murdered. Crime where there is no crime. Jimm is loving it, and she sets out to investigate the mysteries with the help of a cast of interesting and colorful characters including her family. I will say no more. To learn what happens, you will just have to buy the book. + Daughter Jimm Juree is 34 years old, a virgin, and crime reporter. + Older Brother, now Sister, Sissi is a former Transgender Beauty Queen and now Internet mogul / hacker extraordinaire. Sissi stays behind. + Brother Arny is a sensitive (he cries a lot) body builder who was in training for the Northern Adonis 2008 Body Building Competition when they moved. + Mother, Mair, is starting to lose her mental capacities but is kind and generous and only wants the best for her family. + Grandfather, Grandad Jah, is an ex-traffic cop on the job for 40 years, now retired watching cars go by. He barely says a word relying on an occasional grunt to communicate. 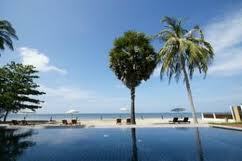 Here is a picture of a resort in Pak Nam. Would I go there? You bet!